At 8:30 AM ET Friday, the Bureau of Labor Statistics will release the July 2011 Non-Farm Payrolls report. Mark it in your calendar. If you’ve been watching mortgage rates fall to new all-time lows this week and fear a mortgage rate reversal, Friday could be the day. The monthly Non-Farm Payrolls data can swing a big stick in mortgage markets. More commonly called “the jobs report“, Non-Farm Payrolls details the U.S. workforce, providing sector-by-sector analysis of workforce, as well as the national Unemployment Rate. The jobs report affects mortgage rates because of how important jobs are to the U.S. economy. 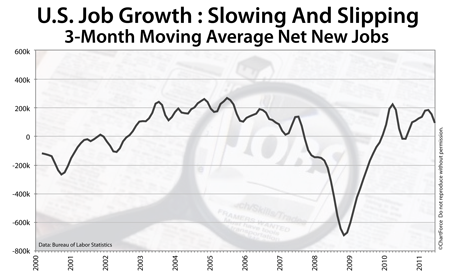 In July, analysts anticipate 85,000 new jobs created. This would be a 4-fold increase from June’s 18,000 figure. The Unemployment Rate is expected to remain unchanged at 9.2%. For rate shoppers and home buyers in TX , these Wall Street expectations can be as important as the actual data itself. Right now, traders placing bets, expecting 85,000 new jobs in July. If the final tally is more than 85,000, traders will load up on equities at the expense of bonds. This is because job growth is good for the economy. When bonds sell off, rates rise. Conversely, if jobs growth is less than 85,000, mortgage rates should drop. Mortgage rates are near all-time lows this morning. By Friday, they could rise. The safe move is to lock your rate today. Rates may fall when the jobs report is released, but there’s much more room for rates to rise. « What Will The Debt Ceiling Agreement Do To Mortgage Rates?